More than half of the world’s population lives in urban areas, trending upward. In Germany, too, many cities are growing. Climate protection, a liveable environment and adequate housing, incorporating environmental protection – all these are decisive factors for cities and rural areas alike. The German Sustainable Development Strategy calls for urban development that promotes “cross-cutting thinking”. The Council for Sustainable Development (RNE) contributes to this goal through its “Sustainable City” dialogue with city mayors and its 30-hectare land use goal. Without the help of impetuses and innovations at the local level, it will not be possible to solve the challenges our world faces. If we are to achieve the goals of the 2030 Agenda and the Paris Agreement, policymakers and societal stakeholders at all levels need to join forces. Just how complex the challenges are is illustrated by the building sector: though our buildings are consuming less and less energy, at the same time apartments are growing larger, increasing the overall area to be heated. The population is not growing substantially, but yet hundreds of thousands of new apartments are built annually, in most cases consuming considerable volumes of mineral resources in the process. While affordable housing is scarce in growing cities, shrinking rural communities are struggling to maintain their infrastructure. Too often, new roads and estates are created on greenfield natural areas, even in areas where cities and villages are wasting away. In doing so, ecologically valuable and agriculturally productive land areas are lost, infrastructure becomes more expensive and the distances in between longer. Be it for work, shopping or holiday, in the absence of decisive action to counter the trend, cars (must) also in future continue to play a key role in society’s mobility despite the availability of numerous alternatives. Isolated technological solutions and efficiency strategies are not enough to create real progress. Whether for climate protection, participation, zero-emission mobility, equal opportunities or an environmentally friendly energy supply – as envisioned by the 2030 Agenda, solutions are already being developed at a local level through new partnerships and across areas of responsibility. Numerous communities have firmly embedded sustainability in their municipal policymaking and created corresponding structures and competences. Cities like Ludwigsburg and Freiburg have set up special councils and an own sustainability management structure. In many places, municipal sustainability strategies have been effected to guide all actions. The cities of Munich and Münster are pursuing socially responsible land usage in order to provide more affordable living space over the long term and enhance management possibilities at municipal level. The “learning city” of Gelsenkirchen, which has been recognised by UNESCO four times for its efforts, promotes Education for Sustainable Development (ESD) as the key to fighting poverty and ensuring equal opportunities for all. The city of Bottrop created the “Bottrop Lab” (Labor Bottrop) to allow its citizens, municipal authorities, the business sector and the scientific community to work jointly on equipping their city for the challenges it faces with respect to climate change and structural change. The city of Delitzsch in Saxony has focused on renewable energy and is today already mathematically energetically self-sufficient. Municipal authorities are also taking on their global responsibility through development partnerships with other cities or via sustainable public procurement policies, such as in the city of Dortmund. Smaller communities, too, are setting key impulses toward climate neutrality and sustainable land management through their strategies and projects, such as the North Sea island of Juist or the joint community of Barnstorf. 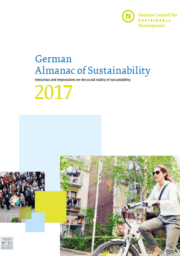 Via its projects and recommendations, the Council for Sustainable Development reinforces the role of cities and rural areas in implementing the German and global Sustainable Development Goals. As early as in 2010, the German Council for Sustainable Development set up its “Sustainable City” dialogue format to enhance this process, with the mayors of over 30 German cities as participants. At the invitation of the Council, these administrative heads discuss with one another, exchange information and give sustainable development policy greater visibility and influence. Through joint publications and policy papers, the mayors underline their responsibility for and their role in municipal implementation of the Sustainable Development Goals. Furthermore, since 2001, the Council has proactively been pursuing the goal of preventing excessive greenfield development. With its Sustainability Culture Fund, the Council supports exemplary projects that point the way forward in the transformation towards greater sustainability. Competitions in the areas of mobility, building and food are held with a focus on initiatives in cities or rural regions. In the “The rural future” (Land schreibt Zukunft) competition, projects from rural areas are promoted in particular. By Ingo Arzt, Journalist - This article was published in the “German Almanac of Sustainability 2018". 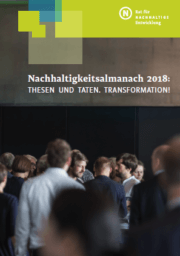 In their policy paper the mayors provide key impulses for sustainable development and implementation of the 2030 Agenda in German municipal-level policy.